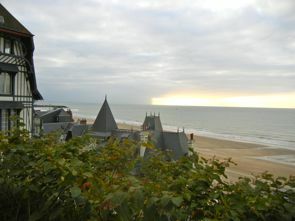 Along with its more famous neighbor, Deauville, Trouville was developed in the 19th century. Trouville-sur-Mer is a resort town on the coast of Normandy, just a short drive along the Côte Fleurie (Flowered Coast) from Deauville. It's also just a short drive (about 20 minutes) from Honfleur. Developed in the 19th century, Trouville today still has many Victorian summer houses and several casinos, as well as more modern hotels and restaurants. Like Deauville, its wide sandy beach has a wooden boardwalk (Planches) that runs the length of the beach. Trouville tends to be somewhat less expensive and more informal than its more trendy neighbor, Deauville. Its main street offers a variety of restaurants, cafés, and bars. French author, screen writer, and director Marguerite Duras (1914-1996) lived in Trouville. She is perhaps best known for the novel Moderato Cantabile and for writing the screenplay for Hiroshima, Mon Amour.